In various Regional Fisheries Management Organizations (RFMOs) established under multilateral treaties, we actively make the following three important and significant contributions: (1) To implement smooth and fair discussion in various Working groups, Scientific committees and annual Commission meetings, in order to promote "Sustainable use of resources, management of the optimal level of fishing capacity and conservation of the marine ecosystem": (2) To facilitate adoption of optimal and agreeable decisions on various issues in these meetings, especially in the tuna RFMOs (WCPFC, IOTC and ICCAT) and the demersal fish RFMOs (NAFO and SEAFO): and (3) To strengthen relevant international cooperation in these RFMOs. 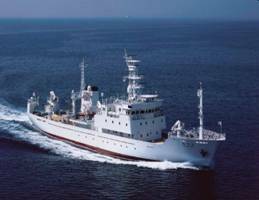 The research vessel, Shunyo Maru (887 GT) is a trawler-type research vessel mainly engaged in the research on living marine resources such as tunas, whales/dolphins, squids and groundfish, and the oceanographic observation in the coastal and offshore waters in the Pacific Ocean. 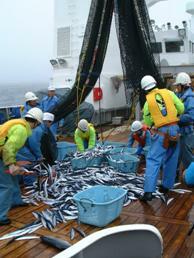 (c) Copyright National Research Institute of Far Seas Fisheries,Fisheries Research Agency All rights reserved.